Fermenting, Tacos & Oh My! Whew, what a long day! And a fabulous day! For Christmas, my mom gifted me with a few hours with one my my favorite raw chefs, Stacey of Learn Fresh Cuisine. It was her introductory class I took over a year and a half ago that started me on my raw adventure. I decided to use the time to throw a girls birthday party at my house for my sister that included my mom, sisters and family friends. 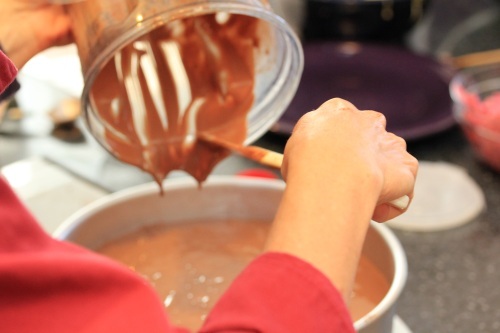 I arranged to tackle a couple of simpler recipes and a decadent dessert recipe for her cake. I jumped out of bed at 7 AM this morning to hit the gym and get ready before Stacey showed up at 10 to start preparing ingredients. We had a great time chatting and chopping for about an hour before the guests arrived. First lesson was fermented veggies, or homemade sauerkraut, which is something I’ve been wanting to get into for awhile now. 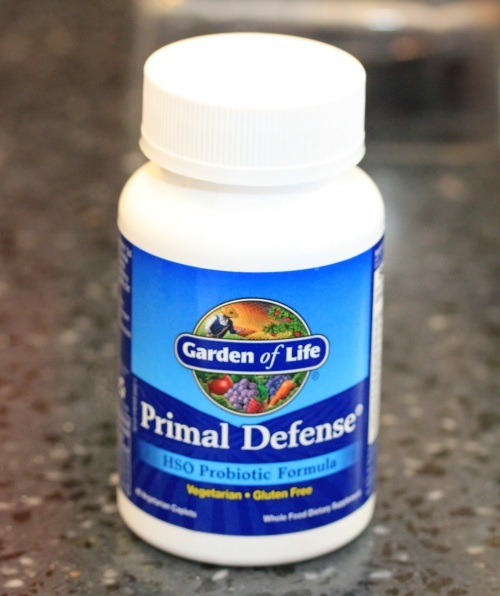 She had me pick up Primal Defense Probiotic Formula from the chilled cooler of Whole Foods vitamin section for the demo. 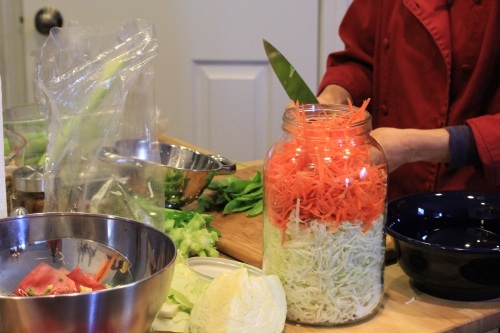 She brought a huge jar to pack with shredded cabbage, carrots and mung bean sprouts for fermenting. She placed one of the probiotic pills, about 5 cups of water and a couple of tablespoons of salt into the Vita-Mix, and blended. She poured the mixture into the veggies noting it’s important all the veggies are submerged in the liquid and used two pieces of celery to brace across the top of the jar and pack in the veggies under the liquid. 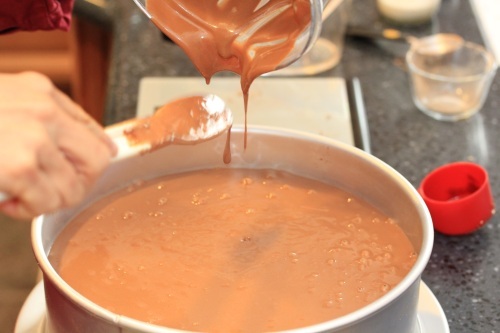 Then put the lid on tightly to thoroughly shake and mix. 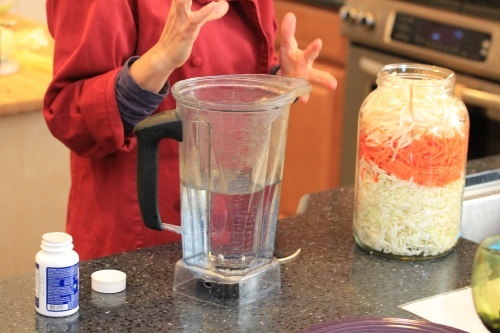 Then she loosened the lid slightly and recommended I place the jar in a tray or bowl because water will start seeping through the lid as it ferments. This monster jar should be ready in 7-10 days because of the cooler winter temps, but should only take 2-3 days in the summer. She also brought a very strong sample she made with red cabbage, it was fermented for a couple of weeks and almost a little too strong for me by itself, but probably great mixed into a salad. It was a great demo and I’m thrilled to be able to make my own now! 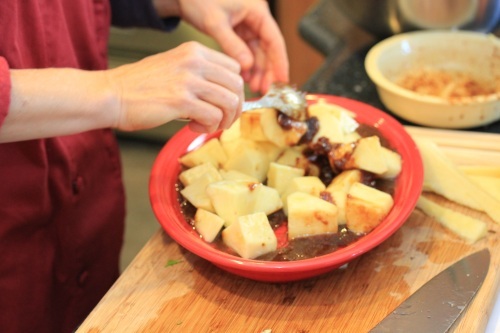 Next she demonstrated a raw stir “fry” recipe by making a wonderful ginger marinade for pineapple chunks. 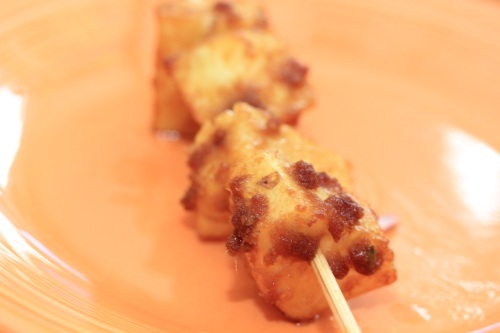 We skewered the chunks and placed them into my Excalibur dehydrator to marinade and warm up for about 20 minutes while the rest was of the dish was prepared. My house was filled with a sweet ginger smell while they were marinading, it was great. The rest was a blend of chopped veggies tossed with the same marinade. 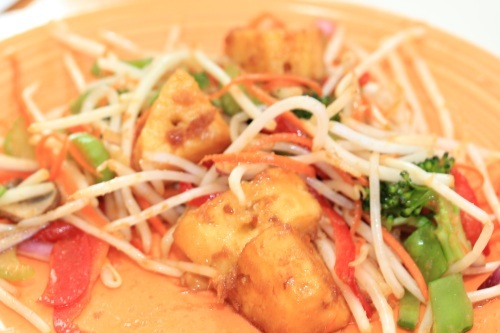 Mung bean sprouts were added and it was served with the pineapple chunks for a raw stir “fry”. It was a so good, I really appreciated the strong ginger flavor and sweet tang. Next we put together raw tacos and Stacey brought already made corn tortillas since we didn’t have a few hours to dehydrate them, but gave everyone the recipe. 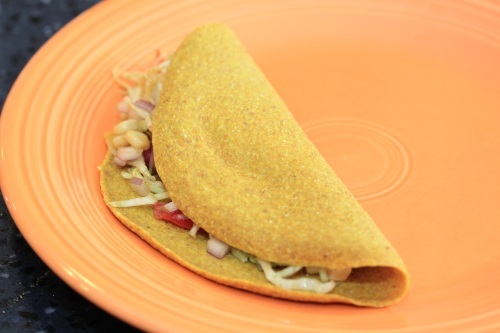 The filling was shredded cabbage, red onions, red peppers, corn and avocado chucks mixed with a wonderful orange-lime sauce and served inside the raw tortillas. Very tasty. But next time I might add hemp nacho sauce and maybe black beans or even Ani’s raw taco nut meat. 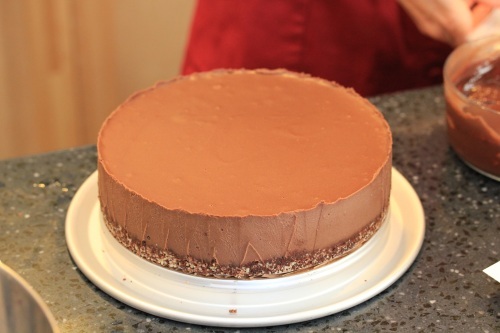 Next was time for dessert – a mocha chocolate raw cheesecake and it was perfect for my sister since she’s a fan of anything coffee. In my Vita-Mix, Stacey blended soaked cashews, coffee and many other ingredients to make the cheese cake filling and poured it over a nut/date crust in a spring form pan to be chilled in the freezer. 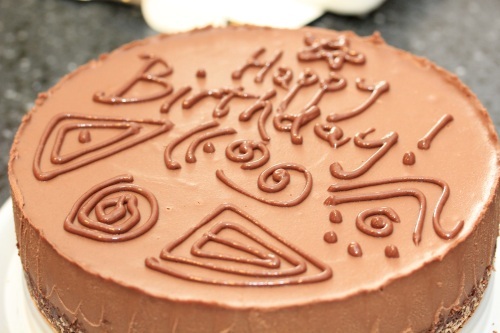 Since the finished cake had to freeze for a bit, she brought another finished one to serve right away and raw chocolate icing to let us get creative with a cake decorating kit. The cake was so rich and dense that only a small piece was needed and it was wonderful! 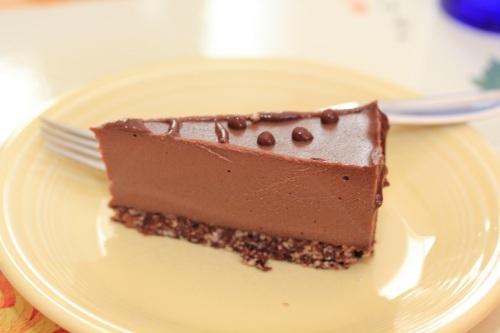 Thick, rich and creamy chocolate with a strong coffee flavor and a crunchy crust. We tried, but only got through about half of the cake and I made my sister take the rest home for the guys. After all, I had another one waiting for me in the freezer. Everyone seemed to have a great time watching Stacey in action, chatting, taking notes, talking health and absorbing as much as possible. For me it was fun watching how an experienced chef worked in my kitchen, used tools, etc. Seriously this is an awesome idea for a party because everyone can get involved, ask questions, try new foods and have a great time. 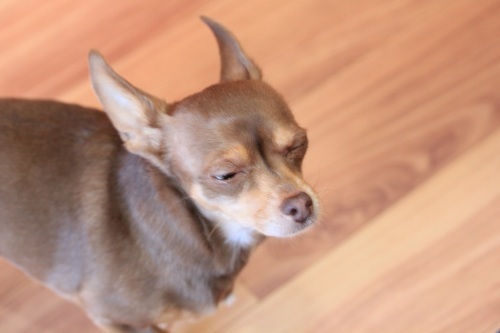 My dog was totally impressed, can’t you tell? Actually she was exhausted from all the excitement and guests and fighting the urge to doze off, so cute. that cake. wow. so thick and decadent looking. AMAZING!!! the fermentation for the cabbage…a tiny bit of salt (bonus for me! ), 1 pill, 5 c water. That’s it?! Omg i am soo doing this after your 7-10 day field report! 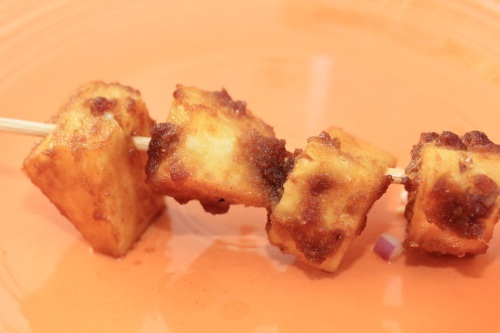 The ginger marinade was awesome, I will be making that recipe lots. You’d totally love the cake, the mocha flavor is so rich and perfect. Yeah, that’s it on the fermentation – seems so simple, right? I can’t wait to try it, it’s probably a lot like the stuff I get from Whole Foods – but fresher tasting and cheaper. Plus I have control of what veggies I want to add. 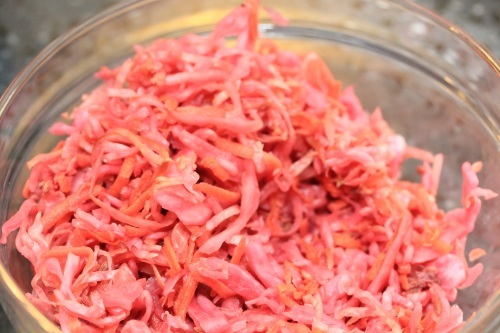 I JUST blogged about discovery how much I LOVE sauerkraut on my salads. This is the perfect recipe! What an amazing day!!! Do you have the recipe for the corn tortillas? Will have to share the raw fermentation with my husband. He’s been on a pickling kick — I wonder if there is a way to use the fermentation process with dill and other spices to make fermented pickles? We actually used the Excalibur a lot during the demonstration to warm up raw honey and coconut oil for the dessert preparation, warm up the raw corn tortillas before serving and accelerate the marinading process – lots of fun! You can add just about any spices you want to the fermentation liquid, dill would probably be great. I might even try orange spices and other seasonings as I get into experimenting with it. Wow! Great photos and I wish I could have been one of your girlfriends in attendance. She had some great ideas there too with the pineapple and ginger. 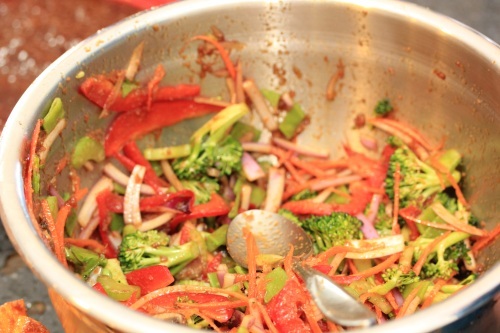 I made a really yummy live un stir fry once and took it to a dinner party – they polished it off and left the cooked food!!! Crazy hey? 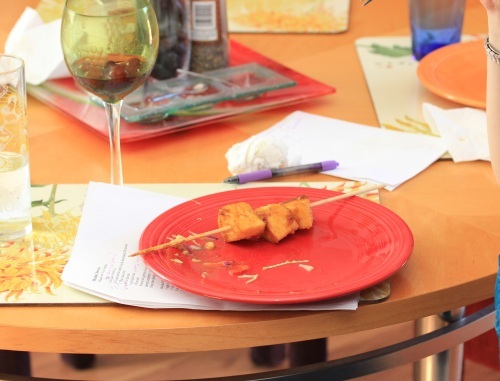 That’s great about your un stir fry, ours was a hit too at the party with the sweet ginger and pineapple chunks. I’ve cultured veg before, almost just like that—except I ordered the starter instead of using probiotics. I guess using the probiotics is easier, and I forgot why the company selling the starter said it’s “better” (of course they would say that!). 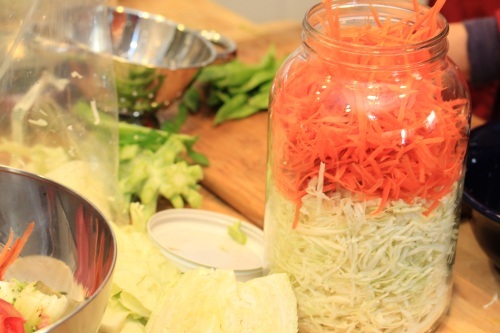 Different combos of veg fermented together taste way different….adding a little onion to cabbage and carrots tastes pretty good, even on its own! I’m totally going to try the cultured veggies based on your description. I’m purchasing a Vita-Mix in Feb..been saving and saving for it and finally almost there. Do you love your vita-mix and would you choose to get the second container for grinding grains or not? Thanks for sharing, I’m glad you had such a nice gathering! That’s great, I was so happy that she made fermenting look so easy and something I could get into. Vita-Mixes are totally worth it, I saved up for months to get mine too and what a difference compared to my last blender! 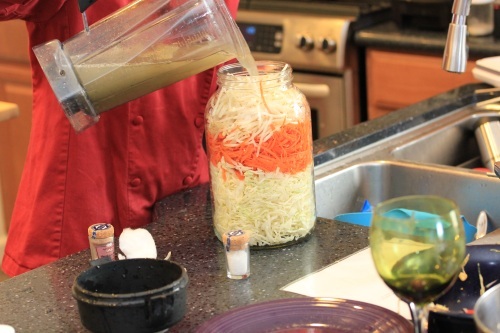 The smoothies were much smoother, it had no problems turning raw nuts into cream and pureeing raw winter squash chunks – it really is amazing and has helped me create many wonderfully healthy veggie based stir fry sauces, salad dressings, etc. We just made some kraut and fermented veggies, but we do not add probiotic to it. I have never heard of that besides when making yogurt. Interesting, we will have to try it next time. omg Christine! What an awesome gift your mom got you ! So cool, I wish I lived closer to you and could of came! I would of brought a bottle of wine too ; ) ha! Have a great night love and hope you got all that laundry done!!!!! What a fun class!! Awesome! That cake…wow. 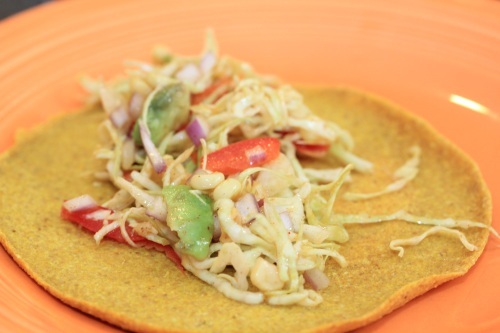 Do you know the recipe for the raw taco ingredients? The cabbage mixtures looks really good! 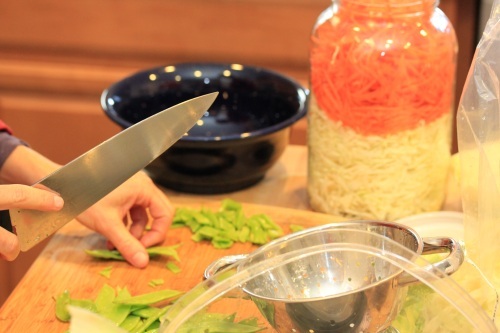 What a creative and way easier way to make fermented veggies! I may have to steal that. Could I use any probiotic powder? Thanks, Christine, and did you use Mike Snyder’s airlock cylinder kit on top of this gal. glass jar? That is what I found on the internet and have been using on them plus did one time Sauerkraut in the Harsch fermenting crock pot (2.2 gal.) after I got my guts up. Saved almost the cost of the Harsch crock with the first batch since it is expensive to buy in the health food stores (they got to make a living, too). I did Rene Oswald’s recipe for that (she has some good recipes with videos online – like her Curried Kale Chips also).